Their season is over after a loss to the Green Bay Packers in the NFC Divisional Playoff on Sunday but we found one very large Dallas Cowboys collection worthy of attention. 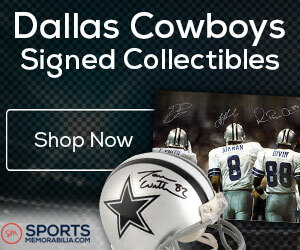 Stoney Kersh of Arlington, TX has been collecting Cowboys memorabilia since he was a pint-sized football fan. Safe to say he’s not pint-sized anymore…and neither is his collection. Kersh is one of those guys who isn’t satisfied with a binder of cards, a few autographed pictures or a shelf full of bobbleheads. His patio is an ode to the stadium. He’s got rotating display cases. Bookcases jammed with well-organized items. He’s got Cowboys stuff dating back to the team’s birth in the early 1960s all the way up to the 2014 season. At least 100,000 pieces, he says. And after he took WFAA-TV on a tour, it’s hard not to be impressed.